Megabus changes their Washington, DC stop as of March 1, 2011. It is projected to be a measure that only lasts a few months. Construction at the previous location is causing several companies to have to relocate for at least the time being. The new Megabus stop in Washington, DC is at K St. and N. Capitol NW. To help passengers, the company is running a free shuttle over to Union Station from the new stop between the hours of 6:45 pm - 11:45 pm. on the 15 minute and 45 minute mark. The shuttle from Union Station to the new bus stop is at on 1st St NE just south of G St. NE. The Megabus website says that this shuttle will run “on the 0's and 30's” between the hours of 7:00pm to 12:00am. Knoxville service is also changing. Two trips to DC from Knoxville will be offered daily. We have no information on whether this is a this temporary or a change to reflect the summer travel season. All we could get out of the company is that they take a “number of factors into consideration” when making changes. Departure times from Knoxville are now 10:30 am and 10:30 pm. I haven’t had a chance to get back to DC since the changes. I’ll be able to tell you about the nearby creature comforts as soon as I get the traveling opportunity. In the meantime, if you’ve been there please post a comment below. Keep checking this blog. 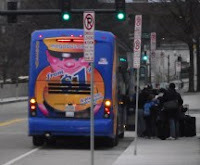 We’ll post about Megabus changes on the Washington, DC stop and Knoxville bus service as we find out about them. Read all of my Megabus articles here. Is there a way to easily get from the Knoxville bus station to the airport? Hi and thanks for asking. The only way to travel between these two places is to take a taxi. Take this url to an article that explains more. It also links to a list of taxi companies in Knoxville. A group will be traveling from Dc to Knoxville on May 26th at 11:00 am we want to know how to get from the Megabus drop off to Enterprise rental? Your best bet is to either have friends pick you up or take a taxi. If the Enterprise you need is at the airport this article may help. Another option is to see if Enterprise could pick you up from the Megabus stop. Let me know what works for you. I'll be glad to share it with my readers. i think this is best wayo to to go to airport.